Regent Antiques has been trading in London for three decades. We specialise in English and Continental antique furniture, silver and porcelain. Our main markets are Europe and North America and we export worldwide. 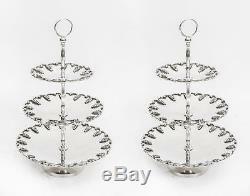 Vintage Pair Silver Plated Tiered Cake Biscuit Stands. These is an exquisite pair of silver plated cake stands. There is no mistaking their high quality and individual design, which is certain to make them a talking point at your table. The stands are identical and feature three tiers getting smaller as they go up. The edges are adorned with detailed bunches of grapes, which finish the edges stylishly. The central stem has a ring at the top for holding. As vintage items, the pieces show signs of use commensurate with age, these minor condition issues are mentioned for accuracy and, as seen in the accompanying photographs, they display beautifully. Height 38 x Width 29 x Depth 29. Height 15.0 x Width 11.4 x Depth 11.4. Take a tour of our London showrooms. Take Piccadilly line to Manor House station. Go to top of escalators and turn left. Take exit 7 and walk straight on for 10 metres. Manor Warehouse is on the right. There is car parking available on site. Please make all cheques payable to Regent Antiques. Bank details: Regent Antiques - BBVA - Account: 05701615 - Sort: 23-59-11. For the best value, we recommend offsetting this cost by purchasing multiple items. The item "Vintage Pair Silver Plated Tiered Cake Biscuit Stands" is in sale since Wednesday, May 24, 2017. This item is in the category "Antiques\Silver\Silver Plate\Bowls". The seller is "regentantiquesuk" and is located in London N4 1BX. This item can be shipped worldwide.